Following the successful launch of Alpine 11 PLUS for Intel, ARCTIC has received a number of requests from AMD users for a compatible version with the same outstanding price-performance ratio. In order to fulfill this market demand, ARCTIC introduces the Alpine 64 PLUS to satisfy AMD power users. 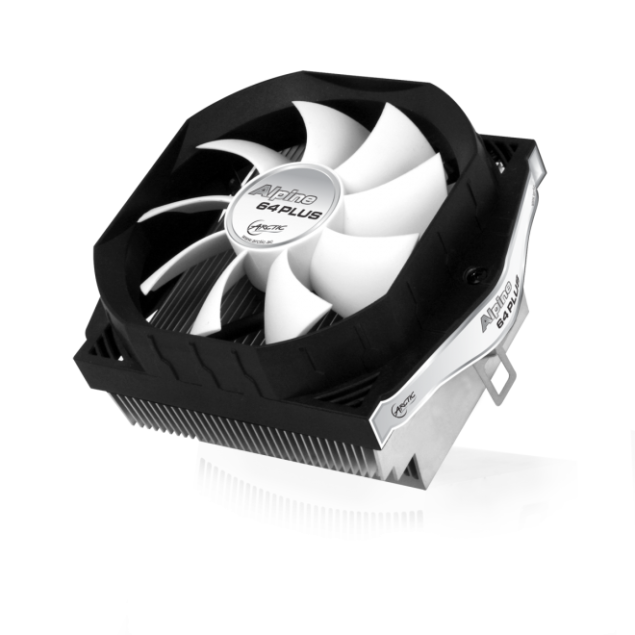 The Alpine 64 PLUS provides a perfect cooling solution with its optimized heatsink to dissipate heat from the CPU.Its high performance 92mm PWM-controlled fan operates at a fan speed range of 600 to 2000 RPM reaching a maximum cooling capacity of 100 Watts. With a noise level of only 0.4 Sone even at full load, you can hardly hear any sound from this cooler. Furthermore, it comes with a pre-applied ARCTIC MX-4 thermal compound and a transport-proof mounting system for quick installation and maximum user-friendliness. The Alpine 64 PLUS is simply what power users are looking for when it comes to having sufficient cooling at the lowest noise level at an affordable price. This cooler is compatible with AMD Sockets FM1, AM3+, AM3, AM2+, AM2 and 939. Not that you will ever need it, this cooler does come with a six-year limited warranty with an MSRP at 14.95 USD/ 10.94 EUR, excl. VAT.